October 08, 2017 at 2:39 pm. The state of the state of Texas football was bad last season. How bad was it? Texas fired third-year coach Charlie Strong amid his third consecutive losing season. Yet another Texas A&M November fade put Kevin Sumlin on one of the hottest of coaching hot seats. Even steady-as-it-goes TCU fell off to its second losing record in four seasons. And you may have heard that Baylor had a few issues. The Bears, after the school’s sexual assault scandal, are in a category of their own, a longer-term fix. As for these other three, they’re fixin’ to do more than just watch the Oklahoma schools take over college football. This was supposed to be the Year of the Sooner State. Oklahoma and Oklahoma State — with senior quarterbacks and offensive fireworks — were supposed to rule the Big 12 and battle for a spot in the College Football Playoff. Well, ahem, TCU already upset the Cowboys in Stillwater, and the Sooners broke a wagon wheel with Saturday’s home loss to 30-point underdog Iowa State. Look at the early Big 12 standings. It’s TCU and Texas at the top, at 2-0. 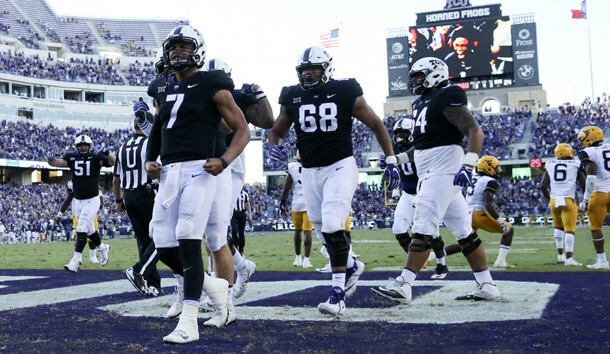 The Horned Frogs are 5-0 behind rejuvenated senior quarterback Kenny Hill and an athletic, swarming defense that has been coach Gary Patterson’s hallmark way more often than not. Texas and Texas A&M, meanwhile, are making progress with quarterbacks in their first rodeos. New Longhorns coach Tom Herman has resisted giving the reins to true freshman Sam Ehlinger, but sophomore incumbent Shane Buechele has been dealing with injuries and barely practiced last week. Ehlinger, in his third start, went the whole way Saturday in a thrilling 40-34 double-overtime home victory over Kansas State. Ehlinger was 30 of 50 for 380 yards against Kansas State, adding 107 yards on the ground. His elusiveness and moxie are not unlike that of the guy in Norman — Baker Mayfield. “Tough kid, not just physically but mentally,” Herman said of Ehlinger. Move on quick, kid. Texas (3-2) has games against Oklahoma and Oklahoma State in the next two weeks. Texas A&M is 4-2 and, because of injuries, has turned to true freshman quarterback Kellen Mond. Like Ehlinger, he made freshman mistakes Saturday — an interception and a lost fumble against No. 1 Alabama — but he completed 19 of 29 passes for 237 yards as the Aggies hung in OK in a 27-19 home loss. Nobody expected the young Aggies to be among the SEC elite — and they aren’t. That’s Alabama, Georgia and Auburn. But nobody else in the league is so daunting to think that Sumlin can’t win at least four more games in the back half of the schedule while building around Mond and leaving the coaching drama to schools like Tennessee. The growing pains are still evident at Texas and Texas A&M. Each painfully lost games in the Los Angeles area last month — the Longhorns to USC in overtime, the Aggies to UCLA in an all-time epic collapse. But, with those still-green quarterbacks, at least there is growing. With TCU serving as a playoff-crasher this season, everything, once again, is getting bigger in Texas. 1. Wisconsin puts the Big Ten West in a headlock. The Badgers (5-0, 2-0 Big Ten) used a typically strong running game to silence upset-minded Nebraska on Saturday, scoring the final 21 points to win 38-17 in Lincoln. With that head-to-head victory, coupled with Iowa’s two league losses and Northwestern’s failure to launch, Wisconsin has a clear path to the league title game. 3. Oklahoma has a secondary problem. The Sooners can recover from their 38-31 loss to Iowa State. They pocketed a win at Ohio State, and have multiple statement games on the tee. But all that won’t matter unless defensive coordinator Mike Stoops solves a pass defense that has allowed two conference foes to complete 53 of 77 passes for 831 yards, with eight touchdowns and no interceptions. 5. Stay tuned to the Pac-12 North. The stretch run will be fascinating. Washington, Washington State and Stanford each won Saturday, staying on course for a round-robin in November. Keep this in mind: The North champ has won all six Pac-12 title games. 1. Penn State RB Saquon Barkley. Northwestern tried to everything to stop him — allowing quarterback Trace McSorley to have a big day — and mostly did, other than Barkley’s 53-yard touchdown run in the second half. Barkley’s rushing totals are modest for a Heisman favorite, but his pass-catching, kick returning and highlight-making keep him in front of a wide-open race. 2. Stanford RB Bryce Love. Utah did as good a job as anyone this season of bottling up Love, and he still ripped off a 39-yarder and 68-yarder for a fourth-quarter score that provided the cushion in an eventual 23-20 win in Salt Lake City. He has eight runs of at least 50 yards this season. That’s twice as many as every team in the country, other than Tulsa (five), Arizona (five) and Notre Dame (eight). 3. Washington State QB Luke Falk. The Cougars keep winning and his touchdown-to-interception ratio is a glossy 19-to-2. His candidacy will keep growing as WSU should enter November at 9-0. 4. Oklahoma QB Baker Mayfield. Yeah, he’s down this week, but he’s still the national leader in passing efficiency and one big game this week against Texas will jump-start the hype all over again. 5. San Diego State RB Rashaad Penny. He’s the do-it-all offensive weapon for San Diego State, averaging a national-best 220.8 all-purpose yards per game for the undefeated Aztecs. 1. 37 — The number of years it has been since the last time BYU lost five consecutive games. A game at Mississippi State awaits the 1-5 Cougars this week. 2. 8 — Consecutive games, dating to last season, in which Stanford’s Bryce Love has a run of at least 50 yards. 3. 9 — Interceptions for USC quarterback Sam Darnold, the same number he had last season in 156 more attempts. 4. 1-4 — Michigan coach Jim Harbaugh’s record against rivals Ohio State and Michigan State. The Spartans weathered the storm Saturday to hold off the Wolverines 14-10 in Ann Arbor on Saturday, giving MSU eight victories in the past 10 meetings. 5. 4-1 — Virginia’s record under second-year coach Bronco Mendenhall, the school’s best start in a decade. The Cavaliers were expected to be miserable again after a 2-10 season, but they have NFL players on defense, a solid passing game and a reasonable chance to win its next three — at North Carolina, Boston College, at Pitt. 1. Oklahoma vs. Texas (Saturday, 3:30 p.m. ET, Dallas) — This could be the beginning of a long, exciting chapter in the Red River Showdown, with new coaches on each side — Tom Herman at Texas and Lincoln Riley at Oklahoma. 2. Auburn at LSU (Saturday, 3:30 p.m. ET) — LSU’s win at Florida allowed coach Ed Orgeron to deflect the heat … at least for a week. He’ll roast again if his offense can’t find a way through Auburn’s formidable defense. 3. TCU at Kansas State (Saturday, noon ET) — The Wildcats get TCU and Oklahoma at home in the next two weeks. They will win one of them. 4. Washington at Arizona State (Saturday, 10:30 p.m. ET) — This might actually be the toughest game to date for the 6-0 Huskies. The Sun Devils can score and are coming off a bye in advance of a big home game. This one has #Pac12AfterDark written all over it. 5. Boise State at San Diego State (Saturday, 10:30 p.m. ET) — In a not-great week of games (on paper), the 6-0 Aztecs will look to further their claim as the best from the Group of Five conferences. Other interested parties are South Florida, Central Florida and Navy. Curry: 'No panic' despite Warriors' loss, sending series back L.A.